Having the right tool for the job is essential if you want your home improvement project done right. For those jobs that need superior cutting power, like steel tubing, PVC piping and hardwoods, one of the best tools you can use is a cordless bandsaw. Unlike a traditional bandsaw, cordless models allow you to bring the machine to the material, giving you a level of versatility and flexibility to make any job easier. Read on to find out how two of the best compare with our review of the Milwaukee M12 Vs. Dewalt DCS371B. Compact & Lightweight: Listed at only 6.75 lbs and 12 inches in length, the Milwaukee Cordless Bandsaw is the perfect kind of tool that you’d want to have if you’re constantly on the move, either for your job or if the project you’re working on means you’re needed in multiple different places at once. Because the bandsaw is so lightweight it means carrying it around with isn’t cumbersome, like some other cutting solutions. Powerful Cutting Strength: Even with its small size, the Milwaukee 2429-21xc can really pack a punch. With a SFPM of 280, the bandsaw can tackle material like 3/4in Electric Metallic Tube in only 3 seconds, making getting your job done faster, so you can save time and got on to the next thing. Long Lasting: A portable device isn’t much help to you if you can’t use it. That’s why it’s important that they last long enough to get through the jobs you have for the day. The Milwaukee doesn’t disappoint here, giving you up to 150 cuts per charge with the attached XC High Capacity REDLITHIUM™ Battery. Ergonomic Use: Thanks to the high-quality design of the bandsaw, it can be effectively used one-handed comfortably. Sometimes having that extra help, even if it’s your own hand, can really come in handy. Need to hold something while you make your cut, like a ruler or guard rail? No problem. Competitive Price: Through Amazon, the M12 costs 85, which for this type of device is a bargain, considering so many uses it has. 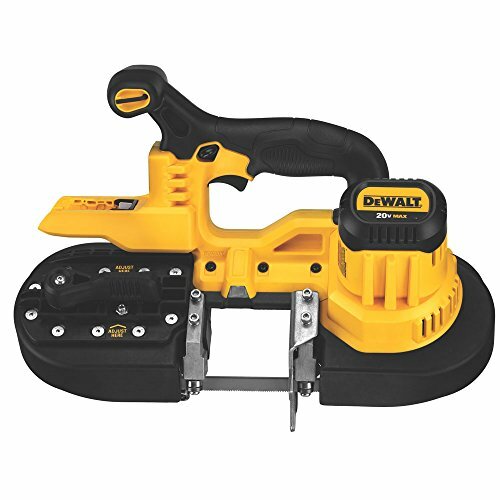 The Tool For Any Job: The Dewalt’s DCS371B has a 2-1/2″ cut capacity and can easily handle 2″ Schedule 40 thick pipe. This means that the bandsaw has ample capability of tackling any job or project that you might be able to throw at it. Blade Tracking: Engineered to track the blade path at all times means you get more life out of your blade as it always cuts straight. Instead of warping and becoming damaged the blade always cuts where you need it. Extending your blade’s life also saves you money. Simple Blade Changes: At times however, the blade will need to be changed as it’s the proper maintenance for a bandsaw. The Dewalt makes this easy by including a toolless changing lever which loosens the blade’s tension making installing a new blade easy and hassle free. LED Work Light: The Dewalt’s DCS371B has a bright LED light fixture installed on it giving you illumination for when working in the dark, ensuring you’re always making accurate cuts. Handle Position: A centered handle position means having stability and balance when holding the Dewalt bandsaw and the handles ergonomic design cuts down on user fatigue as continuously holding the device is comfortable and offers excelled flexibility. In a showdown between the Milwaukee 2429-21xc VS Dewalt DCS371B Cordless Bandsaw there is a lot to consider, as each has a few similarities. They both offer a lightweight design, are powerful to cut through steel pipe with ease and have an intelligently designed handle to offer support while making cuts. In addition, both devices have internal mechanics that also keep the blade straight to perform accurate cuts and to limit vibrations when the blade is moving through the material. Weight: The weight of a portable unit is important and here the Milwaukee is a little less than the Dewalt at 6.75 lbs compared to the Dewalt’s 8 lbs. A lighter power tool means getting less fatigued while you’re using it. 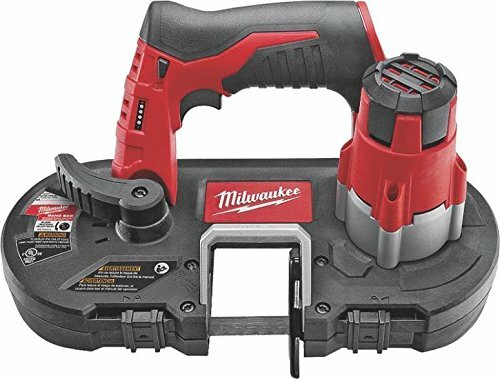 Pricing: The Milwaukee, when purchased through Amazon offers a bit more than the Dewalt and is less expensive. The Milwaukee costs under $200 for the entire bandsaw kit, while the Dewalt is just over $200 for the bandsaw, a blade, and a tuning wrench. A charger, case and battery are sold separately. Cut Capacity: The total cutting capacity is larger on the Dewalt with its max round cut capacity being 2-1/2 in compared to the Milwaukee’s 1-5/8 in capacity. For materials where you need a larger cut capacity this is an important distinction to know. When making your final decision between the Milwaukee 2429-21xc Vs. Dewalt DCS371B Cordless Bandsaw, either option will give you a feature packed power tool. Your decision will ultimately come down to what you need a bandsaw for and the applications that you’re looking to tackle. For those on a budget, the Milwaukee offers a bit more bang for the buck. However, those who have larger jobs on hand may find the Dewalt suits their needs more with its larger cut capacity and higher 20V voltage. Either device will make your project that much easier.